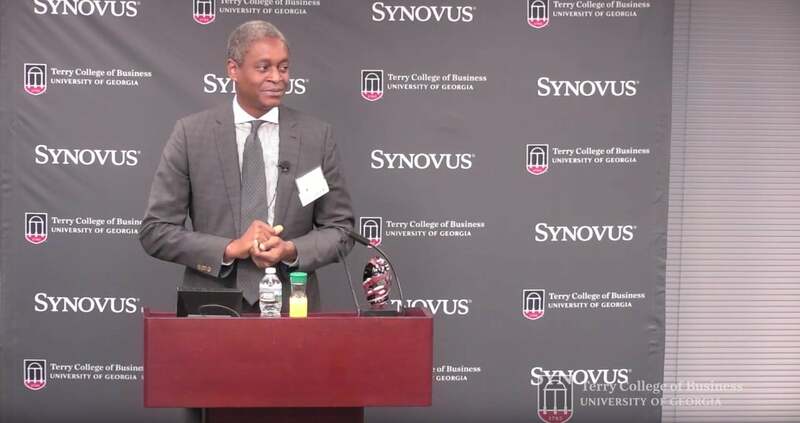 Raphael Bostic, President & CEO, Federal Reserve Bank of Atlanta speaks at Terry Third Thursday on February 21, 2019. You know it's always nice to talk to an academics a group like this is collegiate. And I it's good to continue to have ties with the universities. When I go around the six districts I always make a point to stomp on a college campus to try to talk to young people make sure that they understand the importance of economics and finance and their role in it. Too often I think people are intimidated by the math by the technical language that economists often use and we don't see themselves as being able to contribute. And for me I think our field will be stronger if we have a broader set of people in a larger set of people who participate engage. So I try to do that as much as possible and also try to provide some basic understanding about how economies work with the Federal Reserve does. These are all things that are particularly important and I think moving forward they will become more important as people have access to information from a host of places some of the information is high quality and some of it is less quality. And so equipping people so they can make judgments and draw the appropriate conclusions about what's going on. It is really important. So I thought I would do this morning is talk a bit about the Fed of who we are and what we do just as a reminder. I know guys I've been in the classroom for a while so I want to just level set us all and then I'm guessing you want to hear a little bit about my views on where the economy is and in policy. So I'll leave it I'll leave a little bit of time for that. So and then they'll leave it open up for questions and I think for these sort of sessions actually pretty much all the sessions I do I prefer to leave a lot of time for questions so that we talk about the things that you're interested in. So the Federal Reserve we are the nation's central bank. We are the bankers bank if you will. And so we are responsible for overseeing the nation's monetary policy and really charged with setting an environment that allows our economy to grow in a stable and sustainable way. Our orientation is long term and so we're really trying to create sort of a space for people to be able to make long term plans on what they're doing what they'd like to do and businesses give businesses an opportunity to provide to do long term planning as well. We do that mainly through monetary policy but we have other charges. Indeed we are a bank regulator. So we have responsibility for making sure that financial that the financial sector and the financial system is operating in a safe and sound way and remains resilient. So I have a bunch of bank examiners who go around and investigate banks since they really supervise banks investigate sounds too accusatory. So we investigate banks. No I said it again. See I've got my media person here and whenever I say a word I always look down. So if you see me look down and I change my word you know she just did a nod. So we supervise banks and we really tried to make sure they operate in a safe and sound way. There is basic risk in doing banking lending has reduced risk inherent in it. So we're not trying to say that there's no risk taking that should be taken but we want to make sure that when the risks are taken that the institutions are recognizing the nature of them and are taking safeguards to the extent possible to make sure they're around tomorrow. In addition to that we have some responsibility and engagement in the payment system so everyone has. I think most of you still have some cash. I hear more and more that nobody does anything with cash but but in fact we know that the demand for a currency in the U.S. has actually increased considerably since since 2010. So cash the Federal Reserve notes that's ours. If you've ever done a wire transfer that is done over fed backbone is run out of the Fed Reserve Bank of New York. The Federal Reserve Bank of Atlanta has a retail payments operation so we facilitate a lot of the clearing and settlement that happens in basic retail transactions. So the Fed touches pretty much everybody every day and we provide value and most people have no idea about this. And in some level that's by design. All right if things are working and no one has to know this assume the system's going to work. But I do think it's useful at times.